The United Arab Emirates Armed Forces (Arabic: القوات المسلحة لدولة الإمارات العربية المتحدة Al-Quwwāt al-Musallaḥa li-Dawlat al-ʾImārāt al-ʿArabīyyah al-Muttaḥidah) is the armed forces of the United Arab Emirates and has primary responsibility for the defence of all seven emirates. It consists of 100,000 personnel, and is headquartered in Abu Dhabi, UAE. The United Arab Emirates Armed Forces is commonly nicknamed as "Little Sparta" by United States Armed Forces General and former US defense secretary James Mattis due to its active and effective military role, particularly in the War on Terrorism, despite its small active personnel. The Trucial Oman Scouts, long the symbol of public order on the coast and commanded by British officers, were turned over to the United Arab Emirates as the nucleus of its defence forces in 1971. Although initially small in number, the UAE armed forces have grown significantly over the years and are presently equipped with some of the most modern weapon systems, purchased from a variety of outside countries, mainly France, the US and the UK (the former protector of the UAE). Most officers are graduates of the United Kingdom's Royal Military Academy at Sandhurst, with others having attended the United States Military Academy at West Point, the Royal Military College, Duntroon and St Cyr, the military academy of France. France opened the Abu Dhabi Base in May 2009. In March 2011, the UAE agreed to join the enforcement of the no-fly-zone over Libya by sending six F-16 and six Mirage 2000 multi-role fighter aircraft. During the Gulf war, the US had troops and equipment stationed in the UAE as well as other parts of the Persian Gulf. Recently, Norway has suspended arms exports to the UAE due its involvement in the Yemeni Civil War. During their respective operational periods in Afghanistan, Canada and Australia operated long range patrol aircraft and theatre airhead support from undeclared bases at Minhad Air Force Base. The Canadian name was Camp Mirage. In recent years, the government has implemented national service and it is compulsory. There are two distinct military organizations in the UAE: the federal military force is called the Union Defence Force, and several of the Emirates maintain their own forces. As part of the military of the United Arab Emirates, the Ground Force is responsible for land operations. The United Arab Emirates Air Force has about 4,000 personnel. The air force agreed in 1999 to purchase 80 US F-16 multirole fighter aircraft. Other equipment includes 60 Mirage 2000s, British Hawk aircraft, and French helicopters. The air defense has a Hawk missile program for which the United States has been training. The UAE has taken delivery of two of five Triad I-Hawk batteries. The Air Defense Force is responsible for civil defense aircraft and protecting the country therewith. The United Arab Emirates Navy is growing, with more than 2,000 personnel and 72 vessels. United Arab Emirates Marines – The UAE maintains a small battalion-sized marine force called the UAE Marines. It is equipped with BMP-3s. United Arab Emirates Coast Guard – The United Arab Emirates Coast Guard is the official coast guard agency of the United Arab Emirates and is primarily responsible for the protection of the UAE's coastline through regulation of maritime laws, maintenance of seamarks, border control, anti-smuggling operations and other services. Four Emirates maintained their own forces prior to the unification of the defence forces. Three were theoretically merged into the Union Defence Force in 1976, but in practice remained under emirate control and procured weapons separately for some time after. Abu Dhabi Defence Force – Formed in 1965 by order of Sheikh Shakhbut Al Nahyan and commanded by Major Edward 'Tug' Wilson. The officer corps were mainly British and Jordanian. Although not initially an operational force of consequence, by 1975 it had grown to 15,000 men with two squadrons of Dassault Mirage III fighters and Dassault Mirage 5 attack aircraft, a squadron of Hawker Hunter fighter-bombers, 135 armoured vehicles, Rapier and Crotale missiles, Aérospatiale Alouette III and Aérospatiale Gazelle helicopters, and a sea defence wing of four fast patrol boats. The ADDF became the Western Command of the UDF in 1976. Dubai Defence Force – Formed in 1971, by 1975 the DDF had 3,000 men with Ferret and Saladin armoured cars. It later expanded to 20,000 men in one infantry brigade group, Aermacchi MB-326 ground attack aircraft and MBB Bo 105 helicopters. The DDF became the Central Command of the UDF in 1996. Ras al-Khaimah Mobile Force – Formed in 1969, it initially had 300 men with Ferret and Saladin armoured cars, organised into one armored squadron and two infantry squadrons. It eventually expanded to 9,000 men. It became the Northern Command of the UDF in 1996. In addition, the Sharjah National Guard was formed in 1972. It was essentially a paramilitary force of 500–600 men with Shorland armoured cars. It merged with the Federal Police in 1976. A UAE Armed Forces Special Ops soldier assigned to Special Operations Task Force-West, patrols villages in Afghanistan on April 7, 2011. It dispatched an infantry battalion to the United Nations UNOSOM II force in Somalia in 1993, it sent the 35th Mechanised Infantry Battalion to Kosovo, and sent a regiment to Kuwait during the Iraq War. In addition, it helps protect the Persian Gulf and Strait of Hormuz. It is a leading partner in the campaign against terrorism, providing assistance in the military, diplomatic, and financial arenas. The UAE military provides humanitarian assistance to Iraq. The UAE sent forces to assist Kuwait during the 1990–1991 Gulf War where several hundred UAE troops participated in the conflict as part of the GCC Peninsula Shield force that advanced into Kuwait City. The US 363rd Tactical Fighter Wing (Provisional) operated from Al Dhafra Air Base in Abu Dhabi, and US ships operated out of UAE ports. The UAE air force also carried out strikes against Iraqi forces. The UAE Armed Forces participated in the coalition with an army battalion along with a squadron of Dassault Mirage 5 and Mirage 2000. 6 Emirati troops were killed in action. The UAE Armed Forces participated in UNOSOM II which was an intervention launched in March 1993 until March 1995, and committed resources to the United Nations mission. UAE Military field engineers arrived in Lebanon at 8 September 2007 in Beirut for clearing areas of south Lebanon from mines and cluster bombs. A UAE deployment in Afghanistan started in 2007. In 2015, the UAE participated in the Saudi Arabian-led intervention in Yemen to influence the outcome of the Yemeni Civil War (2015–present). On 4 September 2015, 52 UAE soldiers (together with 10 Saudi and 5 Bahraini soldiers) were killed when a Houthi missile hit an ammunition dump at a military base in Ma'rib Governorate, marking the highest death toll on the battlefield in the country's history. In 2016 Battle of Mukalla, the United Arab Emirates Armed Forces liberated the port of Mukalla from AQAP forces in 36 hours after being held by AQAP for more than a year with the US defense secretary James Mattis calling the UAE led operation a model for American troops. However, in 2018, the Associated Press in a report mentioned that the UAE struck deals with AQAP militants by recruiting them against fighting the Houthis and providing them with money. The report continued to state that the United States was aware of Al-Qaeda joining ranks with the UAE and has held off drone strikes against Al-Qaeda. UAE Brigadier General Musallam Al Rashidi responded to the report by stating that Al Qaeda cannot be reasoned with in the first place stating that “There’s no point in negotiating with these guys.”  The UAE military stated that accusations of allowing AQAP to leave with cash contradicts their primary objective of depriving AQAP of its financial strength. The notion of Al Qaeda joining ranks with UAE Armed Forces and the US holding off drone strikes against Al Qaeda has been thoroughly denied by The Pentagon with Colonel Robert Manning, spokesperson of the Pentagon, calling the news source "patently false". According to The Independent, AQAP activity on social media as well as the number of reported attacks conducted by them has decreased since the Emirati intervention. On 30 April 2018 the UAE armed forces, as part of the ongoing Saudi-led intervention in Yemen, landed troops on the island of Socotra. The Independent newspaper reported that the UAE has politically annexed the island and built a communications network, as well as conducted census and provided Socotra residents with free healthcare and work permits in Abu Dhabi. Two weeks later on 14 May, Saudi troops were also deployed to the archipelago and a deal was brokered between the United Arab Emirates and Yemen for a joint military training exercise and the return of administrative control of Socotra's airport and seaport to Yemen. In June 2018, a major offensive was carried out by the UAE-led troops in Hodeidah. In 1989, UAE purchased Scud-B ballistic missiles from North Korea. 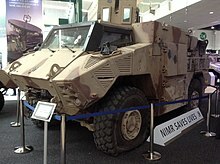 The UAE went on an expansion drive in 1995, which began with the 1992–93 acquisition of 436 Leclerc Tanks and 415 BMP-3 Armoured Vehicles. It had learned from the Iranian experiences with having a single supplier for its military and has diversified its arms purchases, purchasing weaponry mainly from Russia, the United States, the UK, Ukraine, France, Italy and Germany. It has also taken care to invest in the systems it has purchased and standardise them according to NATO/GCC Specifications. The equipment purchases was also followed by a programme to increase manpower numbers and Emiratisation programme for the Armed forces. Presently (2005) almost all pilots in the UAE Air Force are UAE nationals, with the restriction of non-nationals to certain positions in the instruction and maintenance divisions of the airforce. More nationals are being trained to fill these ranks, with programmes such as the Technical Trainee Project underway to try to fill the technical jobs in the country. There has also been a qualitative shift in the Personnel in the armed services, with expert instruction being brought in from around the world, refinement of local military training institutions and the increase in standards across the armed forces. In 2008, the UAE bought MIM-104 Patriot missiles and related radar, support services for the Patriot systems. There has been work concurrently on the Hawk systems, the Patriots predecessor, currently in use by the UAE. In the last days of 2011, during a war scare with Iran over the Straits of Hormuz, the UAE announced a purchase of US $3.48 billion worth of American missile systems: 2 radar systems, 96 missiles, spare parts and training. The UAE was the first country to acquire the Terminal High Altitude Area Defense System (THAAD). A contract worth $1.96 billion was agreed for Lockheed Martin Corp to supply two Thaad anti-missile batteries. Battle tested Emirati manufactured APC Nimr restored from Operation Decisive Storm on display in IDEX 2017. The UAE has begun to produce a greater amount of military equipment in a bid to reduce foreign dependence and help with national industrialisation. The Abu Dhabi Shipbuilding company (ADSB) produces a range of ships and are a prime contractor in the Baynunah Programme, a programme to design develop and produce 5–6 corvettes customised for operation in the shallow waters of the Persian Gulf. It has also produced and is producing ammunition, military transport vehicles and unmanned aerial vehicles. In 2007, the first small arm ever produced in UAE, the Caracal pistol, was introduced at IDEX. It became the official sidearm of the UAE armed forces and security forces. The National Guard of Bahrain adopted it shortly thereafter. Jordan ordered an unspecified number of pistol in April, 2008 during SOFEX, the Special Forces Exhibition held in Jordan. UAE and Algeria established on 17 November 2008 a joint committee in order to test the Caracal pistol for further adoption by Algeria. A joint venture agreement was signed in Abu Dhabi on 28 November 2007 between Tawazun Holding LLC, an investment company established by the Offset Program Bureau (OPB), Al-Jaber Trading Establishment, part of Al-Jaber Group, and Rheinmetall Munitions Systems, to set up the Al-Burkan munition factory at the Zayed Military City in Abu Dhabi. The OPB signed four Memorandums of Understanding with leading companies from Europe and Singapore at the Paris Eurosatory 2008 defence exhibition on June 20, Rheinmetall Group and Diehl Defence Holding of Germany, Singapore Technologies Engineering (ST Engg), and Thales of France. Tawazun has also partnered with Saab on radar development. ^ "United Arab Emirates - Defense". export.org. 23 April 2018. Archived from the original on 12 November 2018. Retrieved 11 November 2018. ^ "Emirati Army - Modernization". Globalsecurity.org. Archived from the original on 2018-11-12. Retrieved 2018-11-11. ^ "In the UAE, the United States has a quiet, potent ally nicknamed 'Little Sparta'". The Washington Post. Archived from the original on 18 August 2018. Retrieved 15 September 2018. ^ "BBC News – Libya no-fly zone: Coalition firepower". BBC News. Archived from the original on 9 December 2014. Retrieved 25 December 2014. ^ "Norway suspends arms exports to UAE amid war in Yemen". ABC News. 3 Jan 2018. Archived from the original on 2018-01-03. Retrieved 3 Jan 2018. ^ "United Arab Emirates". U.S. Department of State. Archived from the original on 4 September 2009. Retrieved 25 December 2014. ^ a b De Butts, Freddie (1995). Now The Dust Has Settled. Tabb House. p. 193. ISBN 1873951132. ^ a b c H. Richard Sindelar III and John E Peterson (1988). Crosscurrents in the Gulf: Arab Regional and Global Interests. Routledge. p. 213-213. ^ a b Brigadier General Ibrahim Al-Nakhi. The Gulf war: UAE Participation in that War (PDF). Archived (PDF) from the original on 30 October 2018. Retrieved 11 August 2018. ^ "The Role of the United Arab Emirates in the Iran-Iraq War and the Persian Gulf War". Country-data.com. Archived from the original on 1 May 2011. Retrieved 1 February 2011. ^ "UNITED NATIONS OPERATION IN SOMALIA II". UN.org. 21 March 1997. Archived from the original on 6 October 2018. Retrieved 22 December 2018. ^ Salama, Samira (3 January 2015). "Priming UAE's military into a force to reckon with". Gulf News. Archived from the original on 22 December 2018. Retrieved 22 December 2018. ^ "Tributes paid to 45 Emirati heroes martyred in Yemen". gulfnews.com. Archived from the original on 2015-09-05. Retrieved 2015-09-05. ^ "Yemen crisis: UAE launches fresh Yemen attacks". BBC.com. 5 September 2015. Archived from the original on 7 September 2015. Retrieved 6 September 2015. ^ Reporter, Staff. "UAE salutes 45 soldiers martyred in Yemen – Khaleej Times". khaleejtimes.com. Archived from the original on 2015-09-06. Retrieved 2015-09-05. ^ "US-UAE counter-terrorism operations on the rise in Yemen". "The National". 15 March 2018. Archived from the original on 11 April 2019. Retrieved 11 April 2019. ^ "Inside the UAE's war on al-Qaeda in Yemen". The Independent. Archived from the original on 15 August 2018. Retrieved 15 August 2018. ^ "UAE responds to AP report on deals with al-Qaida in Yemen". Associated Press. 13 August 2018. Archived from the original on 11 April 2019. Retrieved 11 April 2019. ^ a b Trew, Bel (15 August 2018). "Inside the UAE's war on al-Qaeda in Yemen". The Independent. Archived from the original on 11 April 2019. Retrieved 11 April 2019. ^ "Pentagon denies reports of U.S. allies bribing, recruiting al Qaeda fighters in Yemen". Washington Times. Archived from the original on 29 August 2018. Retrieved 29 August 2018. ^ "As Saudi Arabia and the UAE struggle for control of Socotra, Yemen's island paradise may just swap one occupation for another". The Independent. 21 May 2018. Archived from the original on 11 April 2019. Retrieved 11 April 2019. ^ "Socotra island: The Unesco-protected 'Jewel of Arabia' vanishing amid Yemen's civil war". The Independent. 2 May 2018. Archived from the original on 11 April 2019. Retrieved 11 April 2019. ^ "Yemen PM: Crisis over UAE deployment to Socotra over". Aljazeera.com. Archived from the original on 2018-05-18. Retrieved 2019-04-11. ^ "Yemen, UAE Agree on Deal Over Socotra". Al Bawaba. 14 May 2018. Archived from the original on 16 May 2018. Retrieved 11 April 2019. ^ "Yemen separatist leader says Hodeidah offensive will not stop". Reuters. Archived from the original on 20 September 2018. Retrieved 20 September 2018. ^ Diplomat, Samuel Ramani , The. "Why Did the UAE Purchase Weapons From North Korea?". Archived from the original on 2017-08-09. Retrieved 2017-08-09. ^ a b "Gulf States Requesting ABM-Capable Systems". Defense Industry Daily. 2 October 2014. Archived from the original on 16 October 2014. Retrieved 25 December 2014. ^ "US bolsters UAE's missile defense in major arms deal". Archived from the original on 25 December 2014. Retrieved 25 December 2014. ^ April Yee. "Abu Dhabi's Tawazun putting new eyes on the skies with radar deal". Retrieved 25 December 2014. This page is based on the Wikipedia article United Arab Emirates Armed Forces; it is used under the Creative Commons Attribution-ShareAlike 3.0 Unported License (CC-BY-SA). You may redistribute it, verbatim or modified, providing that you comply with the terms of the CC-BY-SA.